The Oceanic VT3 dive computer is a full function NITROX/AIR capable scuba computer. The VT3 is one of the latest computers on the market. It has everything including a wireless transmitter and multiple gas blends that a diver can select during their SCUBA dive. Since Oceanic is one of the best scuba computer manufactures, we expect only the best from their research and development department. The VT3 measures depth, dive time at depth, air supply and calculates nitrogen loading as well as air consumption. On the Nitrox side of the world, the VT3 adjusts for EAN levels up to 100% and measures the diver’s Oxygen exposure. The wireless transmitter can monitor up to three different Nitrox mixes, from your buddy or from your transit tank. •	Four modes of operation: Free Diving, Stand Alone scuba computer, air integrated and Nitrox integrated scuba computer. 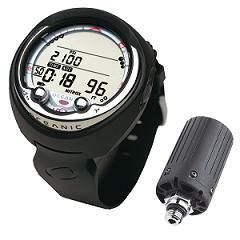 For those of us who record every dive religiously, the Oceanic VT 3 will record up to 50 dives (Date and Time stamped). •	USB connection to download your dives onto your home laptop or computer.